Girls vs. Boys “Laptops”: Guess Which Does More? Back in 2009, Lisa posted about microscopes and telescopes in a Toys’R’Us catalog. In both cases, the pink version was the least powerful option. Also, it looks more like a packet of birth control pills than a laptop. The lack of apostrophe in "its" bugs me slightly as much as the blatant gender stereotyping. This reminds me - was there ever a post here (or somewhere else) discussing the weird tendency to code white smartphones/tablets/laptops as female and black ones as male? I wish there was some sort of interview with whomever it was that made the decisions on this. The price is lower on the girls, which could partly be because it's smaller, looks cheaper (smaller screen, no track pad) and costs less to make. But perhaps it's because a pink version of the "Boys" wasn't expected to sell as much, so the profit per sale is the same on each? I suppose this asks if the products are gendered -- at this point -- because the consumers act on gender stereotypes, or if if they're gendered because the marketers/producers simply feel that consumers will act on gender stereotypes. Aside from the vocal group of non-gendered-toy-buying-parents, as my nephew has, it seems that perhaps it's the consumer who is to blame here. It's not explicit, but these posts almost always seem to put the blame on Toys 'R' Us or the advertiser or the producer. Is it their "fault"? All I'm asking for is perhaps a bit more insight into why this is the way it is, rather than just one more example of what is "Wrong" with society. Being pink is function enough. But if you count being pink and decorative, that's two more functions right there. So who cares about "Slave made goods FLom Amiable VeneLable Cathay" as long as it's "Equal Opportunity" sweatshop garbage...? Even the toy computer I got for Christmas in 1988 had more than 50 functions. This one is a bad deal. But what I wonder most is, what were the 25 functions that they had to omit from the pink one to make it suitable for girls? Anyone have a link to the product data? I found this product on Amazon.uk (http://www.amazon.co.uk/Benross-Group-Function-Laptop-Computer/dp/B009CSSPQW) -- there's no real description anywhere I can find for what it actually DOES, but it seems to be a 'laptop' in the same sense that a moped is a 'motorised vehicle'. It's a toy that has buttons you can push, and may not even have the functionality of a good calculator. It doesn't excuse the sexist presentation one bit, but it's a bad job all around. Wow this makes me angry. I've totally seen this same message in subtle ways so many times- like "in an effort to be more inclusive, we made a dumb version for the girls! And it's pink!" 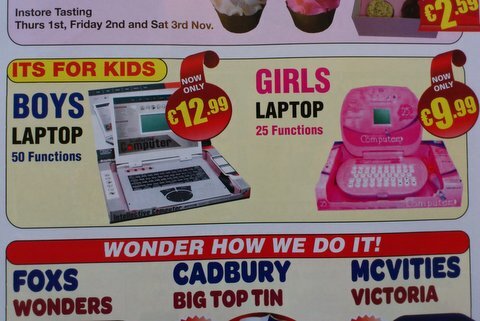 Some girls may like the "boy's" laptop, but I think most would go for the pink one. Question are they made by the same company? Or did you find one company that had a 50 laptop function and another that had a 25 function but only focused on the boy one and the girl one when the one company did make a 50 function for girls and the other a 25 function for boys.